Revelations of donations to the Clinton Foundation after Hillary Clinton joined the Obama administration in January 2009, invite a second look at her decisions as Secretary of State. 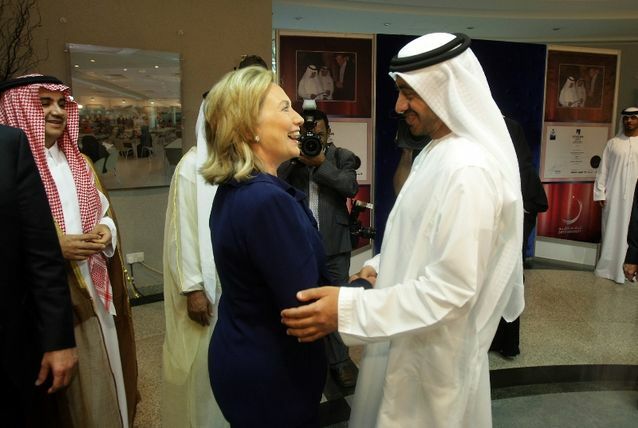 In early January 2011 U.S. Secretary of State Hillary Clinton was en route to the Gulf region with planned visits to Qatar, the United Arab Emirates, and Oman. Her office announced that she will discuss “regional security issues including Iraq, the Middle East peace process, Lebanon, Yemen…and Iran….”She’ll want to take stock of where we are on the sanctions regime.” The growing tension in Egypt was not on her agenda. But on February 11, 2011, violent clashes between demonstrators and security forces in Egypt led to President Hosni Mubarak’s resignation and transfer of his powers to the Supreme Council of the Armed Forces. Next, violent protests, the first major Libyan protests in years against Gaddafi rule, erupted in Benghazi, Libya. The next day the United Nations Security Council voted unanimously to impose sanctions on Libya. And with events moving rapidly, on 27 February the rebels announced the formation of Interim National Council. The INC later termed the Transitional National Council had its base in eastern Libya. It survived because it was protected by the West and its ranks were fed by Islamists, some freed from jails in Egypt. What was then dubbed the ‘Arab Spring,’ was happening. Qatar was among the first nations, if not the first, to announce it would back the Egyptian opponents of the Mubarak regime. It began funding its Ikhwan al-Muslimun (Muslim Brotherhood) allies in Egypt even before Mubarak was unseated. Thus, President Barack Obama was a late-comer when he promised to match Qatar’s $2 billion in support of Egypt with $2 billion of US funds “in the form of debt swaps and credit guarantees in 2011.” (“US ambassador discuss[es] assistance to Egypt,” Ahram Online, 17 August 2012) Then as the Egyptian economy continued to deteriorate, in May 2011 it was reported Egypt would receive the support of the World Bank, and Cairo would receive some $4.5bn in assistance over the next two years. World Bank President Robert Zoellick openly admitted it was the Bank’s desire to support the “Arab Spring.” In sum, by mid-2011 all the big guns were firing and with the West supporting its aims in Egypt, and helping to overthrow Gaddafi in Libya, the Ikhwan aims of more than half a century were about to be realized. Who Wanted The Libya War? In Libya, as in Egypt, Qatar was almost certainly the first nation to fund the rebel forces operating to overthrow Muammar Gaddafi. Gaddafi did not “mellow” over the years. Rather, he had been cowed by U.S. warplanes and attacks in the Gulf of Sidra. He understood that Presidents Reagan and Bush meant business when they threatened to destroy his terrorist training camps. And by 1995, he had closed more than twenty such camps. 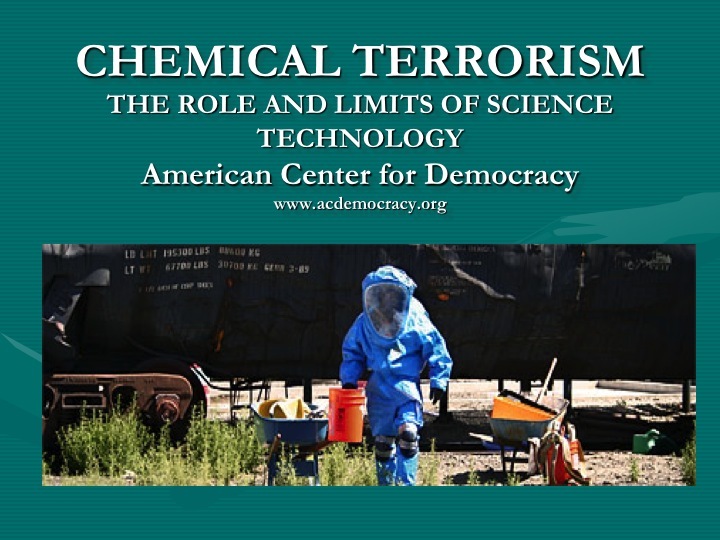 The 9/11 attacks on the U.S. led Gaddafi to eliminate his WMD programs, allow the U.S. to supervise the reduction of his nuclear program beginning in 2003, and the elimination of chemical weapons in 2004. As the years passed and Gaddafi aged, in both dress and demeanor he often seemed more silly than sinister. It was assumed that he was ready to turn over power to his second son Saif al-Islam, the London School of Economics Ph.D. Saif had assumed none of the trappings of power, and while preferring anonymity, he was next to his father the best-known individual in Libya. Still, there were indications that Saif was cut from a different piece of cloth. In 2005, Saif met with Mahmoud Jibril and persuaded the well-known technocrat to join an incipient effort to restructure the Libyan economy. Jibril then joined the Gaddafi government and chaired both its National Council for Economic Development and the National Planning Council. Regarding the Libyan Muslim Brotherhood itself, there was still little give. However, the crackdowns were hardly as severe as those of 1973, 1983 and 1986. Later, Saif al-Islam himself had been responsible for the early release of jailed extremists including Abdulhakim Belhadj a mujahideen who would be a leader in the effort to overthrow the Gaddafi. Belhadj had captured in Pakistan and eventually returned to Libya; He remained in prison until released in a general amnesty arranged by Saif al-Gaddafi in 2010. Ostensibly, those released agreed to renounce violence. Nonetheless, Belhadj worked behind the scenes during the early months of the revolt and likely used the alias Abdelhakim al-Hasidi while operating with anti-Gaddafi forces that emerged in Derna in March 2011. Gaddafi fought to retain power. However, he could do little more than to rail at the Western powers, and his historic bête noire, the Muslim Brotherhood. For months, Gadhafi and his followers struggled to hold off rebel forces, which were surprisingly well-armed thanks to Qatar and the West. That effort was doomed once the rebels received the direct support of NATO air and sea power. Still, Gaddafi’s loyalists had some initial success, and on 15 March the rebels were driven from Brega (the same day that thousands of Syrian protesters first took to the streets demanding the end of the Assad family reign). Following that, Gaddafi’s units initiated an offensive designed to drive the rebels from their positions east and west of Tripoli. As the Libyan Revolution spiraled out of control one was led to ask who was supporting the rebels in Libya. First and foremost there was Qatar funding. It is almost certain that the Thani family and their Muslim Brotherhood allies — both those living in Qatar and elsewhere — sensed the moment had at last arrived to overthrow Gaddafi. While it is usually stated that the governments of France and the UK were solidly behind the effort to depose Gaddafi, the rationale for such action is questionable. Importantly, had the U.S. through NATO opposed their effort, their plan would have been quashed. Since it was not, one is left to assume that President Obama agreed with their motives and supported fed them. Secondly, there was Secretary of State Hillary Clinton. However, Libya did not present a national security threat to the U.S. So, why did Hillary have an interest? A detailed article that in CBC News on 30 March 2011, spotlighted the role of Mahmoud Jibril, the leading member of the rebel Interim National Council (INC). Jibril was a former official in the Gaddafi government and thanks to his alliance with Saif al-had chaired both its National Council for Economic Development and the National Planning Council. With the rebels, Jibril served as an ex-officio director of both foreign affairs and military affairs. Jibril was experienced with feeding the American ego and knew how to deploy propaganda to that end. In less than a month following the attack on the Gaddafi regime, the INC was actively selling itself to the West. Jibril began with a visit to Paris and President Nicolas Sarkozy on March 10; his task was to convince the West that the battle for Libya was not a tribal affair, i.e., west versus east or Tripoli versus Cyrenaica (Benghazi). Instead, he claimed, it was a war of all Libyans against Gaddafi. Jibril succeeded, and France became the first nation to recognize the INC. Jibril then returned to Libya just as Gaddafi’s forces were massing to move on Benghazi. Jibril immediately returned to Paris where on 13 March he met with Secretary of State Hillary Clinton who was in Paris for a meeting of the G-8. Also, present at that meeting was Christopher Stevens, who shortly afterward was sent to Libya as the U.S. Special Representative for the INC, which was then, but two weeks old. Almost certainly the decision was made by Clinton and approved by President Obama. Stevens, a Foreign Service officer, had experience in the Middle East, but no previous involvement with Libya. He would continue as Special Representative until he was killed in November 2011. By then Gaddafi was dead, and Tripoli was invested by a gaggle of political elements unable to form a unity government. Meanwhile, in Washington President Obama stated it was time for Colonel Qaddafi to depart, but he had stopped short of initiating a military action until urged to it by Secretary Clinton. The next in a series of meetings that would seal Gaddafi’s fate was held in London on March 29, at the behest of U.K. Foreign Minister William Hague. The most informative speaker at that conference was Qatar Prime Minister and Foreign Minister Sheikh Hamad bin Jassim bin Jabor Al-Thani. Qatar had already recognized the Libyan National Transition Council, which was then supported by the Muslim Brotherhood, and Thani urged other nations to do so as well. He admitted that Qatar was already providing both humanitarian and military aid to Libyan rebels, and its planes were helping to impose a no-fly zone over Libya. Thani concluded by stressing how important the UN-approved military actions had been in halting the Gaddafi regime in its tracks and thereby saving the Libyan people from a potential massacre. Not surprisingly, the massacre theme was picked up by the State Department and spread through the media, even though Gaddafi himself was announcing to all who would listen that the claim was absurd. On April 5, 2011, at the direction of Secretary Clinton, the U.S. Special Representative Christopher Stevens arrived in Benghazi. And in Washington, it was reported that he was among a group of rebels who were urging a more robust US commitment, including the expanded use of airpower and the deployment of Special Forces. While airpower was available, Special Forces were not (at least as far as anyone has reported). Following the London meeting Qatar Emir, Sheikh Hamad bin Khalifa al-Thani and his entourage hosted US Secretary of State Hillary Clinton at a “working breakfast” held on 13 April. Little was divulged of that meeting other than the usual boilerplate and the fact that the Emir was on “a visit” to the United States. Qatar was one of the few dependable Ikhwan asylums and had been for years. The ruling Thani family welcomed such Ikhwan notables as Rachid Ghannouchi of Tunisia and Hasan al-Turabi of the Sudan. It helped fund the latter’s Popular Arab and Islamic Conference (“The Terrorists Internationale”) during the period 1991-1996. Sometime during the run-up to Operation Desert Storm, the rulers of Qatar discerned that the United States was a large fish and if angled carefully could support Qatari aims even if they seemed antagonistic to those of Washington. Qatar’s possessions and operations in the Gulf were under continual Iranian threat. Thus the old saw, “the enemy of my enemy is my friend” was employed, and in 1991, Doha concluded a Defense Cooperation Agreement with the United States. Two years later, When Prince Sultan airbase was closed in Saudi Arabia, the US air operations in the Middle East moved to Qatar’s Al Udeid field located south of Doha. Since then the base has been enlarged enormously and now serves as a crucial hub for the U.S. Central Command (CENTCOM). As the situation developed in Libya in late summer 2011, Secretary Clinton remained in telephone contact with Qatar’s leadership. On 4 September she attended yet another conference, co-hosted by French President Sarkozy and Britain’s Prime Minister Cameron. It was a coronation of sorts as in attendance were the Ikhwan favorites, the leader of the Libyan National Transitional Council Mustafa Abdul Jalil and the executive head of the council Mahmoud Jibril. Also in attendance were UN Secretary General Ban Ki-moon, Qatar’s Emir Sheikh Hamad Bin-Khalifa Al-Thani, and US Secretary of State Hillary Clinton, among others. The Thani family knew not only how to plaster a Western facade on an Islamic Emirate, but also how to play the Washington game. It didn’t take a genius to understand that to turn the wheels of Washington one had to know who the power brokers were. And on the Democrat side, the Clintons were the obvious powerbrokers and should be cultivated. Although it is often reported that the William J. Clinton Foundation was founded in 2001, contributions from foreign governments to the have been given since its inception in 1996. Before the nomination of Hillary Clinton to Secretary of State, the Foundation had raised at least $46 million from Saudi Arabia and other foreign governments. Saudi Arabia gave $10-25 million to finance Clinton’s library in Little Rock, Ark., and charitable efforts to reduce poverty and treat AIDS. Qatar was included among other major foreign governments that donated to the effort. And as widely reported now, the Bill, Hillary & Chelsea Clinton Foundation broke its December 2008 agreement with Obama to stop accepting contributions from foreign countries. It turns out the Foundation continued to receive millions of dollars from several governments, including Qatar. Reportedly, in 2014 a Qatari government committee gave the Foundation between $250,000 and $500,000. Previously, Qatar’s government had donated between $1 million and $5 million to the Foundation.